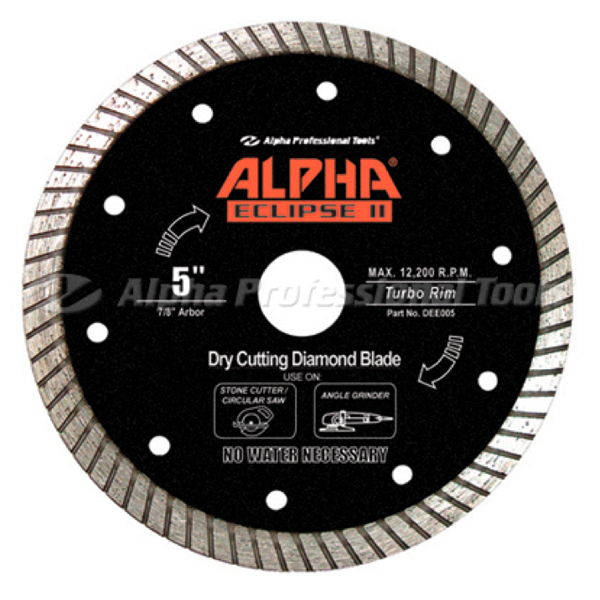 Alpha® Eclipse II is ideal for general purpose use on common building materials such as masonry, concrete and tile. Blade fits on most of the angle grinders and wet stone cutters commonly found in the stone and construction industries. Similar in design to Alpha Plus, the Alpha Eclipse II is versatile and will cut tile, brick, block, concrete, slate and natural stone accurately and cleanly. Tile installers, masons and general contractors will find this blade proven to be a reliable tool that will meet the challenges of cutting modern building products. Cost-effective, long lasting and provides consistent results without chipping. Alpha Eclipse II has no equal when comparing price to performance.